Leggings, we love them. Not only are they some of the most comfortable and flattering types of bottoms out there, there are so many different styles, it’s easy to wear them any day of the week! Our passion for leggings is clear, so it’s no wonder that our Silver Icing Exclusives are one of our flagship products. So why are they are called Exclusives? It’s because our team designs every single pair in-house. That means they are 100% exclusive to us – you can’t get them anywhere else! We create, sample, scrutinize, revise and re-sample each pair over and over again, until every detail is worthy of the Silver Icing brand. Manufactured in the U.S.A., Silver Icing Exclusives are made out of high-quality, breathable fabric designed with your active lifestyles in mind. With incredible 8 way stretch, our fabric moves with your body and is never see-through. We have a number of different styles of Exclusives, and we launch new colours and patterns all the time. With so many options to choose from, we thought we’d create this guide to give you some help! There are 6 different style lengths for you to choose from. 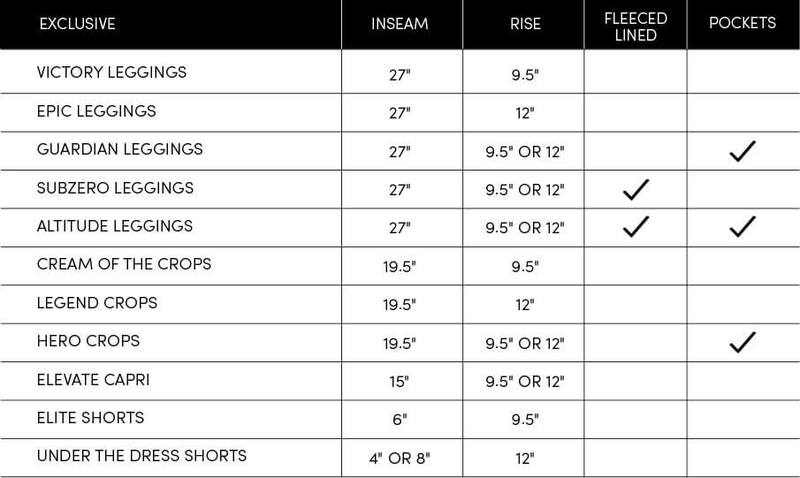 We offer full length leggings (Epic Leggings and Victory Leggings) which have a 27″ inseam, crops (Cream of the Crops and Legend Crops) which have a 19.5″ inseam, capris (Elevate Capri) which have a 15″ inseam, and 3 different lengths of shorts (Elite Shorts and Under the Dress Shorts), which are offered in 4, 6 and 8 inch inseam lengths. Whether you’re working out in the hot summer sun, walking your dog in the fall, or looking for some coverage and added smoothness under a dress, there are Exclusives to match your situation. Almost all of our Exclusives are offered in your choice of a 9.5” or 12” rise waistband. Our advice to you is pick the one you feel the most comfortable in! Our 12” waistband is an extra high, muffin-top free waistband, that has a compression-like, tummy smoothing effect. It can be rolled over to create a 6-7” waistband as well. Our 9.5” waistband is the regular rise that you are probably more used to wearing. This lower rise in our Exclusives is definitely still very figure flattering and comfortable! 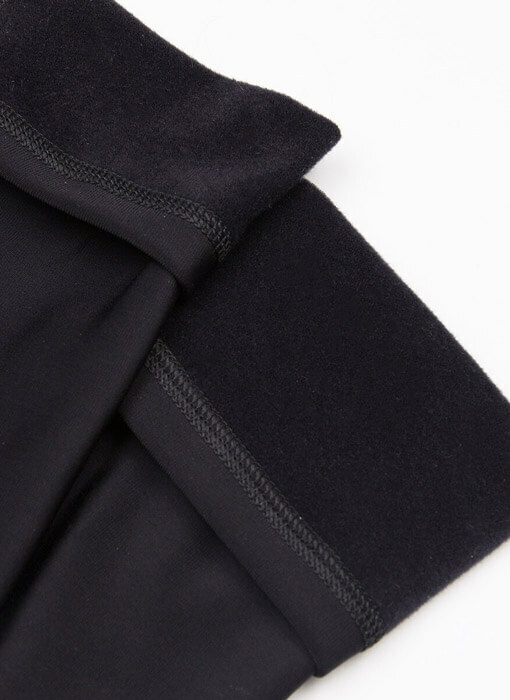 Our signature fleece lined leggings have the same smooth and stretchy feel, but are a bit thicker. Soft and cozy on the inside, they are designed to keep you warm. On a chilly morning, these are what you want to put on! They feel like a warm hug for your legs! Fleece lined leggings can be worn on their own, or layered underneath other items – including snow pants during our lovely Canadian winters. They are also perfect to wear skiing or snowboarding! Available in both waistband rises, and even with pockets or no pockets, you won’t want to wear anything else during the colder months. Finally, we offer leggings and crops with pockets! The pockets are ideal for holding your smartphone and keys, when you’re working out or running, and for your cards when you’re running out the door for a quick item at the grocery store. Whatever season it is, and whatever activities you are up to, Silver Icing Exclusives have you covered!